Greenland’s parliament voted on Thursday (Oct. 24) to end a decades-long prohibition on mining for radioactive materials like uranium, further opening up the country to investors from Australia to China eager to tap its vast mineral resources. The possibility of uranium mining has been criticized by environmental groups. Earlier, a group of non-governmental organisations warned (that they believe) uranium mining in Greenland could threaten the Arctic region’s pristine ecological system. 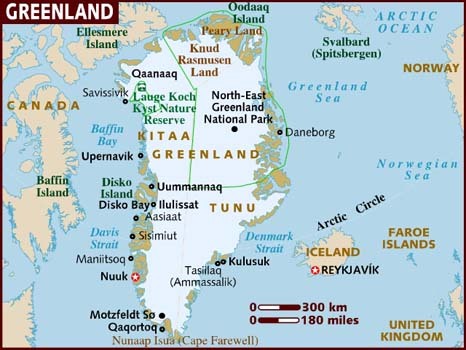 While Greenland is self governing, former colonial ruler Denmark still has a say in security and defense issues and the uranium decision may need to be approved by the Danish parliament – possibly putting the two nations on a diplomatic collision course. Turkish Prime Minister Erdogan arrives to test-drive a train as he attends the opening ceremony of the Marmaray railway. ISTANBUL | Turkey has opened an underwater railway tunnel linking Europe and Asia, and the two sides of Istanbul, realizing a plan initially proposed by an Ottoman sultan about 150 years ago. 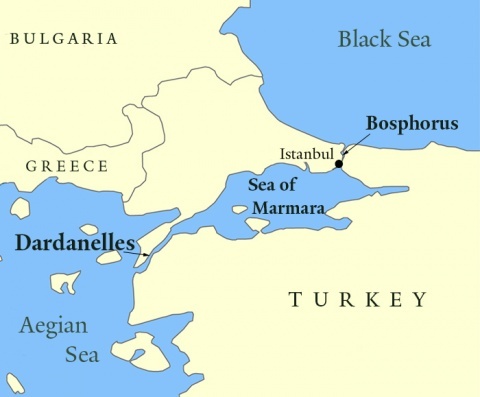 The Marmaray tunnel runs under the Bosporus, the strait that connects the Black Sea to the Sea of Marmara and divides Istanbul between Asia and Europe. The tunnel is 8.5 miles long, including an underwater stretch of 4,593 feet. Officials hope that with up to 1.5 million passengers a day, the tunnel will ease some of Istanbul’s chronic traffic, particularly over the two bridges linking the two sides of the city. A more distant dream is that the tunnel may become part of a new train route for rail travel between Western Europe and China. The underwater portion of the tunnel wasn’t dug, but was dropped in sections to the sea bottom – the immersed-tube method used around the world. Turkish officials say that at more than 180 feet deep, it is the world’s deepest railway tunnel of its type. Started in 2005 and scheduled to be completed in four years, the project was delayed by important archaeological finds, including a 4th century Byzantine port, as builders began digging under the city. The tunnel is just one of Erdogan’s large-scale plans. They include a separate tunnel being built under the Bosporus for passenger cars, a third bridge over the strait, the world’s biggest airport, and a massive canal that would bypass the Bosporus. The projects have provoked charges that the government is plunging ahead with city-changing plans without sufficient public consultation. The concern fueled protests that swept Turkey in June. Tuesday’s ceremony on the 90th anniversary of the founding of the Turkish Republic was attended by Erdogan and other officials, including Japanese Prime Minister Shinzo Abe, whose country was heavily involved in the construction and financing of the railway tunnel project. Japan’s Seikan tunnel linking the Japanese islands of Honshu and Hokkaido is the world’s deepest, getting 460 feet below the seabed and 790 feet below sea level. The Channel Tunnel linking Britain and France is as much as 250 feet below sea level. BEIJING | As many as 64 million Chinese households have had their land seized or their homes demolished during a decadeslong building boom, a study said, throwing an uncomfortable light on the dark side of the country’s urbanization process. China’s new generation of leaders, which took office in March, has championed urbanization as an engine of economic growth. China’s urbanization rate, at 53%, remains low by international standards. Bringing more workers from the agricultural sector into more productive work in cities could help lift China’s economic growth rate, which in 2012 fell to its slowest pace in more than a decade. But the country’s urbanization carries a social cost. 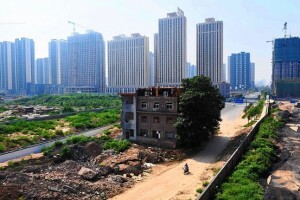 About 16% of Chinese households covered in a survey by Beijing’s Tsinghua University have seen their land expropriated or their homes hit by the wrecking ball at some point. The estimate of the total number of households affected was based on a survey of 12,540 adults and 7,517 children across China last year. It was designed to be representative of the whole population. Most of those who lost their land were in rural areas on the fringes of cities that are rezoned for development, according to the study. China’s farmers don’t have the right to sell land themselves, and are often at the mercy of local authorities who seize land for development projects, often with little concern for compensation. The issue is a frequent source of friction between farmers and local governments. “If we understand that there is such a large-scale process of demolition, perhaps we will not be surprised that there are so many disputes,” said the report. Farmers are typically rehoused and receive cash compensation, but they often struggle to find work or adapt to city life. About 80% of those who lost land received some compensation, though the study didn’t say how much they received. The study also said that only 10% got access to social-welfare benefits in the cities where they were relocated. Under China’s Mao-era household registration system, benefits such as health insurance and pensions are tied to residency. Only 28% of the population has an urban registration, though more than half live in cities. Migrant workers at low-paid jobs in manufacturing and construction, normally have no access to benefits. Just 4% of those rehoused were given help finding work, the survey found. China’s leaders are expected to discuss changes to land policy at a Communist Party meeting next month, but reform will be difficult to push through. Local governments rely on the profits from land expropriations and sales for most of their revenue, and land reform requires big changes to the tax system to give them an alternative source of income. b) What are rare earths and where do most rare earths come from? c) Read the information under "Background" below and watch the video under "Resources." Consider the need for rare earths minerals. 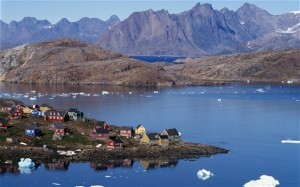 Do you think Greenland's parliament made the right decision to lift the ban on mining? Explain your answer. b) How did Turkey's transportation minister respond to concerns that Turkey has too high a risk for earthquakes for the tunnel to be safe? c) Would this response allay your concerns? Explain your answer. b) Describe the challenges Chinese farmers face when the local government takes their land for a building project. One rare earth deposit being explored by Australian-owned Greenland Minerals and Energy could be one of the largest outside China, which accounts for more than 90 per cent of global production. But still, mining production could be a long way off. "I think the Danish government is prepared for the no-tolerance to be lifted" said Cindy Vestergaard, senior researcher at Danish Institute for International Studies. "After that the Greenlanders and the Danes are going to start hammering all the legal aspects. We will not be mining on Friday, nor next year, or 2015." Lanthanum, cerium, praseodymium, neodymium, promethium, samarium, europium, gadolinium, terbium, dysprosium, holmium, erbium, thulium, ytterbium, lutetium, scandium, yttrium. WHAT ARE RARE EARTHS USED IN? Rechargeable batteries for electric and hybrid cars, advanced ceramics, magnets for electric car motors, computers, DVD players, wind turbines, catalysts in cars and oil refineries, computer monitors, televisions, lighting, lasers, fiber optics, glass polishing, superconductors, and weapons. Rare earths make for smaller, lighter batteries and motors. The drive to miniaturization was first popularized by the Sony Walkman personal cassette tape player. Rare earths are now key to making handheld devices like Apple's iPhone and Research In Motion's BlackBerry. China uses 51 percent of the world's rare earths, while Japan uses 17 percent. Global demand is forecast to grow rapidly as demand for green products increases. China produces over 90 percent of global supplies. China mined 120,000 metric tons in 2008. Molycorp in California produces 3,000 metric tons per year, while Silmet Rare Metals in Estonia produces 2,400 metric tons per year. There are small amounts of rare earths mined in India, Malaysia and Brazil. The demand for dysprosium, terbium, neodymium, praseodymium and europium is set to grow by a minimum of 8 percent a year. Electric vehicle demand for dysprosium, neodymium and praseodymium is set to grow by an average of 790 percent in the next five years. China produces 92 percent of the world’s light rare earths like cerium and lanthanum, which are used in applications like glass manufacturing and oil refining, and 99 percent of the world’s heavy rare earths like dysprosium, which are used in trace amounts but are vital for products like smartphones and compact fluorescent bulbs. China has repeatedly cut its quotas for exports of rare earth minerals from government-approved mines and refineries in the last two years, while raising taxes on the exports. It separately imposed a two-month, unannounced ban on exports of rare earths to Japan during a territorial dispute last September and carefully checked other countries’ orders for rare earths to discourage trans-shipment to Japan. Ottoman Sultan Abdulmejid is said to have proposed the idea of a tunnel under the Bosporus about a century and a half ago. One of his successors, Abdulhamid, had architects submit proposals in 1891, but the plans were not carried out.